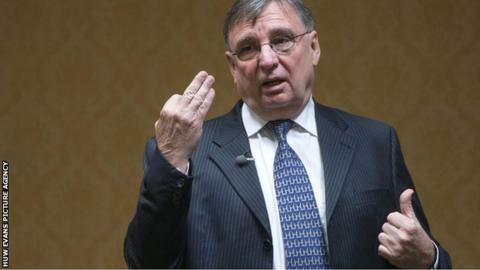 Former Welsh Rugby Union chief executive David Moffett believes Wales could support five professional teams. Moffett, who is seeking election back to the WRU, was in charge of the union when the Celtic Warriors were disbanded in 2004. They were one of the original five Welsh regions along with Ospreys, Scarlets, Blues and Dragons. "There is no way Wales could ever have 12 professional teams again, but it could have five," he said. Moffett oversaw the introduction of regional rugby in Wales in 2003 when the 12 professional clubs gave way to the regions. His latest comments came at an event he organised in St David's Hall, Cardiff, modelled on BBC's Question Time programme. He had hoped to debate the state of rugby in Wales with current WRU chairman David Pickering, but there was no union representative present. Moffett shared the platform with a panel of former Dragons coach Paul Turner, ex-Sport Wales chief executive Huw Jones, Welsh women's rugby international Non Evans and former Wales wing Nigel Walker, who chaired the debate. Over 100 people attended the event. Mr Moffett admitted he had "made mistakes" during his tenure as chief executive. But he insisted that in spite of well-publicised financial problems facing Wales' existing four regions, a fifth could be made viable. "You could have two professional clubs in one region," he said. "In my manifesto, Pontypridd, for example, by 2020, could make an application to become a professional club. "If we all work together and get everything in the right order then I believe we could have another team." The New Zealander is seeking election to the WRU and wants to challenge Pickering for the position of chairman. He has published a manifesto for rugby in Wales, and has accused the WRU of neglecting the grassroots game. The WRU maintains it is backing the amateur game with year-on-year increases in line with a five year plan, and recently announced grants totalling £341,683 had been awarded to 47 clubs to help them improve facilities. However, the union has has declined to respond publicly to Moffett's comments. Moffett claims to have the support of at least 50 clubs to force an extraordinary general meeting of the union. A minimum of 32 clubs out of the 320 registered with the WRU is required to call an EGM. But Moffett added he wouldn't reveal the identity of the clubs until an EGM was called, and has not indicated when that might happen.